All know that duration of sleep is critical for mental and physical wellbeing, but it turns out that sleep position may be another important factor in the quest for optimum health. Specifically, a small body of research suggests that, for many people, sleeping on the left side may be the ticket to better health and better sleep. The theory stems from Ayurveda, a holistic approach to health and medicine that originated in India. 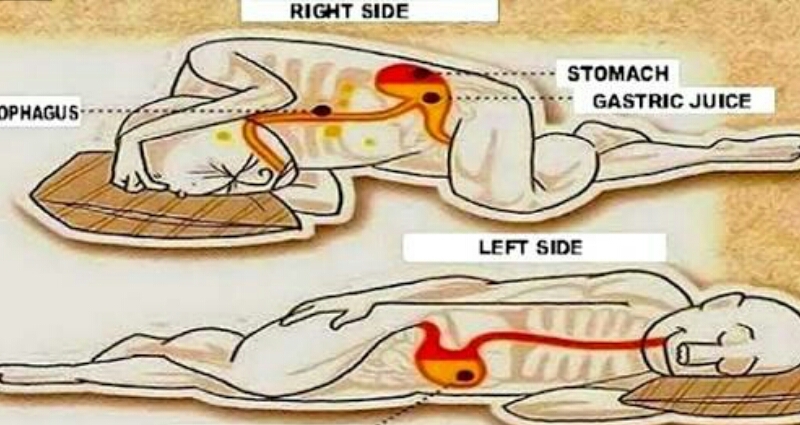 So why all the fuss about sleeping on the left side? Turns out it may be good for our digestion, our backs, and even our hearts due to the positions of different organs. Here are six potential benefits that may be derived from catching some Zzzs while lying on your left side. fluid and waste via the lymph nodes as the left side of our body is the dominant lymphatic side. Western research has also found that sleeping on the left side can help the body process waste materials from the brain. In contrast, sleeping on your right side can decrease the lymphatic system’s efficiency. stomach and pancreas to hang naturally (our stomach lies on the left side of the body), which can keep the development of pancreatic enzymes and other digestive processes humming. (Need help visualizing this process? Consult the image above). Doctors have long recommended that pregnant women sleep on their left side in order to improve circulation to the heart. Even if you’re not pregnant (or a woman), sleeping on the left side may help to take some pressure off the heart, as gravity can facilitate both lymph drainage toward and aortic circulation away from the heart. That said, it should be noted that there’s some debate over whether sleeping on the left or right side is best for heart health. 4. It’s ideal for pregnant women. Sleeping on the left side doesn’t only improve pregnant women’s circulation. It can also help to relieve pressure on the back, keep the uterus from squeezing the liver, and increase blood flow to the uterus, kidneys, and fetus. For this reason, doctors tend to recommend that pregnant women spend as much of their sleep time as possible on their left sides. 5. It may reduce heartburn. A study published in The Journal of Clinical Gastroenterology found that lying on the left side can help reduce acid reflux symptoms . Again this is because our stomach lies on the left side. Conversely, lying on the right side may aggravate these symptoms. The effects are fairly immediate; if you’re struggling with heartburn after a meal, try taking a 10-minute lie-down on your left side. 6. It may relieve back pain. relieve pressure on the spine. Feeling more comfortable, in turn, will improve your chances of getting a good night’s sleep. While all of these factors point to compelling reasons to start sleeping on your left side, it’s important to note that some people—including those with heart disease, sleep apnea, glaucoma, and carpal tunnel syndrome— may not benefit from side sleeping. If you’re unsure about what sleep positions may be best for you, it’s always a good idea to consult a medical professional. If you are ready to make the switch, you’ll find that it may take some time to build the new habit of sleeping on your left side. Implementing a few simple strategies can help ensure a smooth transition. For instance, you may want to experiment with putting a body pillow behind your back so that it’s harder for you to roll off of your left side during sleep. It can also be helpful to try sleeping on the opposite side of the bed than you normally do; that way your sleep orientation won’t feel much different (even if you’re sleeping on your opposite side). It will also be important to choose a mattress that’s ideal for side sleeping . Because sleeping on your side can put pressure on the hips and shoulders, it’s important to choose a softer mattress that will help relieve pressure in those areas. Also be sure to look for a mattress that allows the spine to rest in natural alignment. And of course, make sure that whatever mattress you choose feels comfortable to you. The combination of a comfy bed and a health-promoting sleeping position is sure to increase your chances of sleeping well and feeling great whenever you wake up.